Annie Lees, age 74, at Lisa Rumrill’s Wreath Barn, in Cuttingsville, Vt.
CUTTINGSVILLE — If you need to find Annie Lees, of Cuttingsville, Vt. any time between the first of November and a week after Christmas, look no further than what’s become known as Lisa Rumrill’s Wreath Barn, where Lees and her team of gloved craftsman weave bows of balsam and fir, nibble decorated sugar cookies, and tap toes to country-western renditions of Christmas classics. It’s as though the entire tradition of Christmas were funneled into the two car garage in a sweet smelling, country-twanging, bustling hands sort of way. 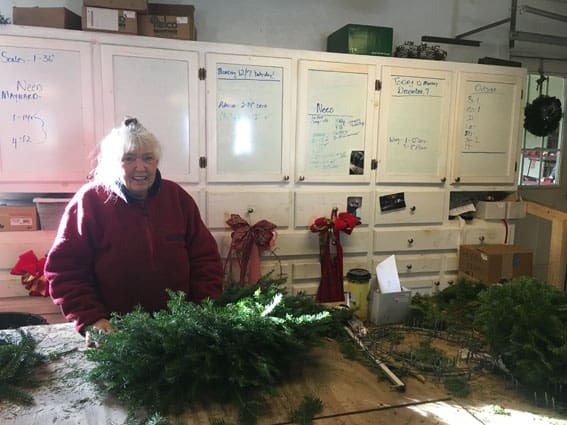 Lees has run the business for 32 years; it has grown from about 50 wreaths a year, to just over 2,000 this past season, not to mention garland rope long enough to extend several football-fields. Lees handed over a Halmark card from one of her clients. He had addressed the note to “The Cuttingsville Wreath Angels,” and Lees cooed at his appreciation. She also ran a daycare out of her own house just up the street which was also the original location of the wreath barn. About 8 or 9 years ago, she moved the wreath-making into her neighbor’s garage. “When I started hiring people, and started really getting going, buying extra table and things like that, then it really became something big, and it was awesome, just awesome,” says Lees. The room is mostly filled hip-high plywood tables that house levered devices that bend the wreath frames. Needles are everywhere, and so is ribbon, wire, wire cutters, pliers, broken pencils, and empty cookie tins. On the wall closest to the house is a collection of white boards with lists of clients and their orders. “Every year it just gets bigger and bigger,” she said. When Lees says goodbye to her clients it is not unusual for her to plant a kiss and hug those who’ve come to visit; it feels like an honor and she bestows it on every return client, and likely some the new ones. She will also offers them an invitation to her annual “Pickin’ Party” in the spring, smile genuinely, and then turns to the whiteboard, Christmas music already back on the boombox.